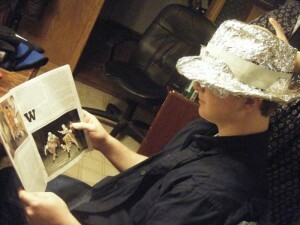 According to the documentation that he had seen, it was recommended that you build a base over your original hat out of aluminum foil, so that the tape will not stick to your hat. 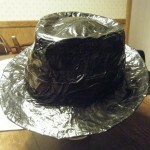 Makes sense to me, so we started by wrapping a piece of duct tape around the hat, sticky side out so the foil we were using for the crown would form properly. 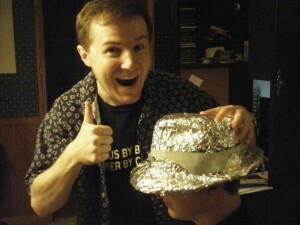 I basically had him wear my hat and used it as a form to mold the foil over (since he was going to wear it anyway). Like a day at the barber. This worked out nicely, since I could press and form the hat over his head with ease. 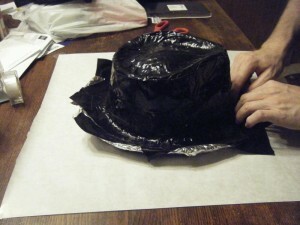 After molding the crown (the top part) of the hat, I then wrapped another piece of duct tape, sticky side out, so that I could piece together the brim. 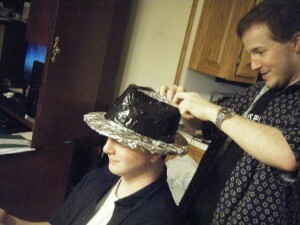 Once all the foil was in place and the hat shaped, it was time to start with the tape. 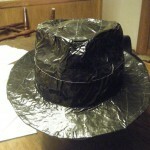 I started from the hat band and worked my way up to the top, layering on tape around the foil form. At the top, I layered tape over the top, following the contours of the form. With the crown capped off, I had him remove the hat and we started work on the brim! We laid out some wax paper to keep the tape from sticking to the table. 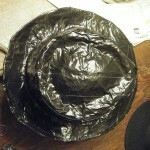 We don’t have to be perfect in this step because we will trim the hat brim down to shape. 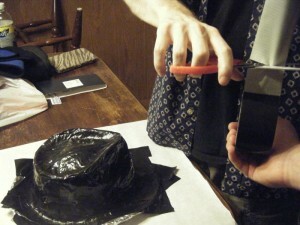 After the brim has been covered with tape, we’ll then peel the whole thing off the paper and turn the thing over. 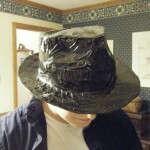 Next, we’ll peel back the foil and tape a little to remove our original hat. 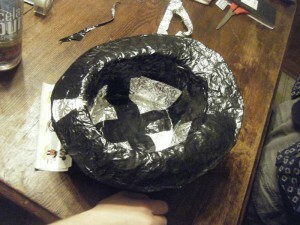 After that we’ll trim down the foil and tape, just above the crease where we folded the foil around the brim. 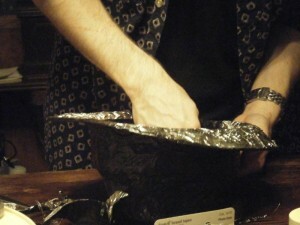 Next, fold the foil flat to the brim. At this point, I felt it necessary to reinforce the crown with a tape across the inside (front to back and left to right). Now that we’ve added support to the hat, we can work on the underside of the brim. 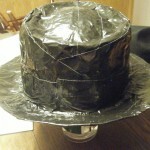 Cut short pieces of tape and work your way around the brim along one side to the back followed by the same action along the other side. 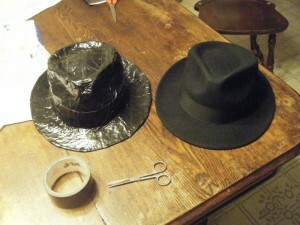 After that, I cut a piece of tape long enough to go around half the brim and then cut that strip down the length and used the pieces to cover the seam on the edge of the brim where the top and bottom layers meet. Now we’re pretty much done. I added another strip of tape around the outside of the crown as a hat band. You would also add a decorative bow if you wanted to. 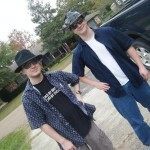 This entry was posted on Sunday, November 29th, 2009 at 10:34 pm and is filed under Analog Life, Awesome. You can follow any responses to this entry through the RSS 2.0 feed. Responses are currently closed, but you can trackback from your own site.